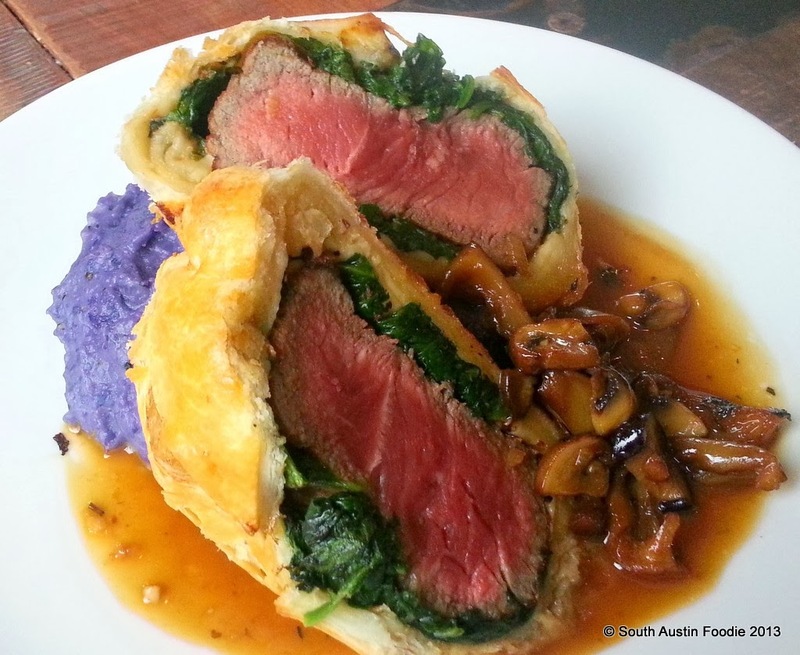 Beef Wellington with purple potatoes. We were all struck by how beautifully the beef was cooked and the gorgeous contrast of the potatoes. 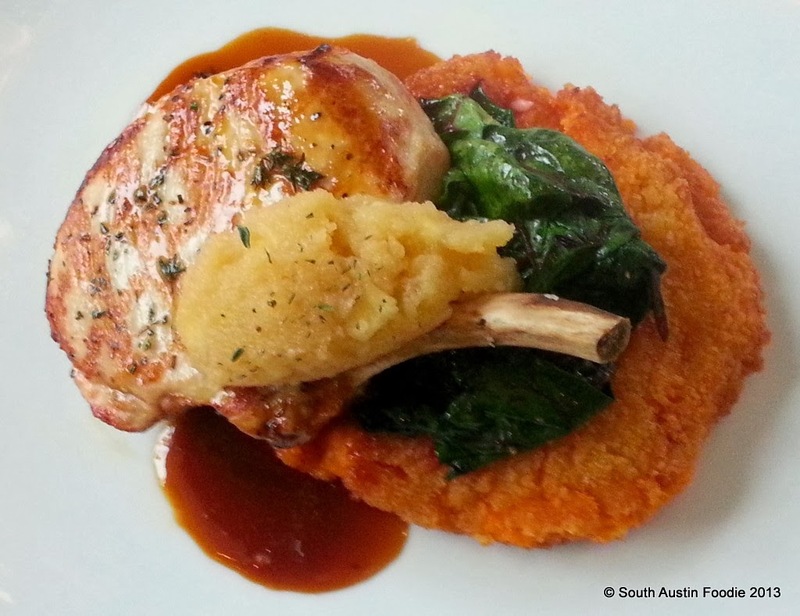 Pork chop with apple sauce, chard, and sweet potato patty. 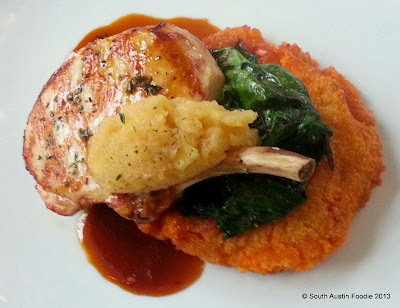 I often find pork chops to be dry, but this was very juicy (perhaps brined? ), and the sweet potato was encrusted with panko bread crumbs, giving it a light crust. 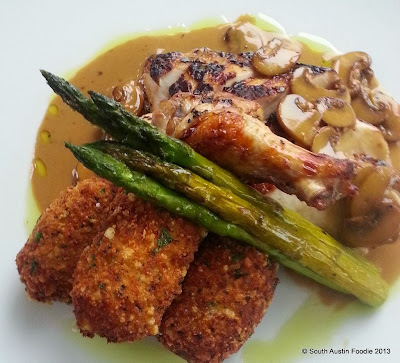 Chicken with marsala mushroom sauce and blue cheese potato croquettes. 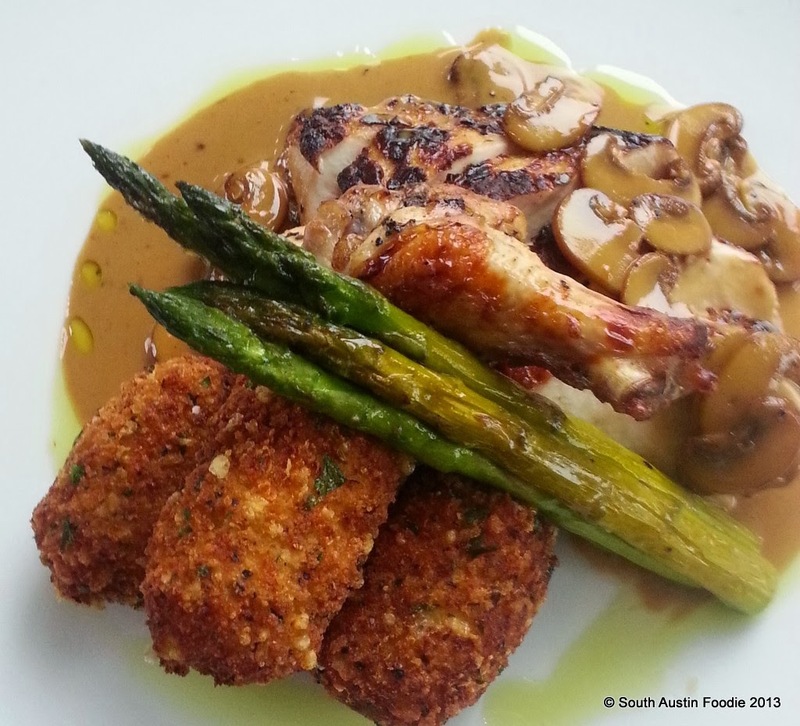 One of the most lovely marsala sauces I have ever had. Local free range chicken too, and the potato croquettes were very crisp, well-fried, and not too strong on the blue. 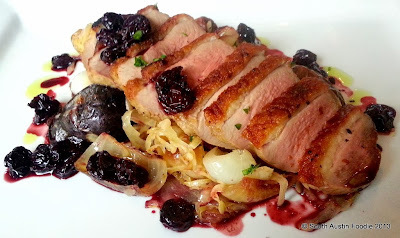 Roasted duck breast with cippoline onions, pickled cabbage, and port cherry sauce. * Very nice contrast of the savory onions and cabbage with the sweet/tart of the cherry sauce. Quail stuffed with chicken mousseline. 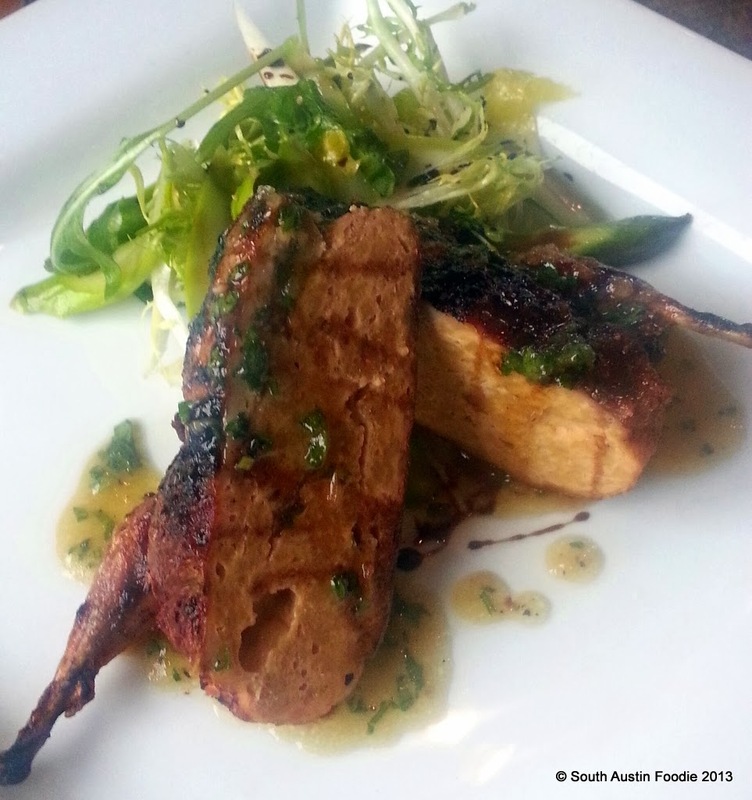 * I have no idea how you stuff a tiny quail, but it was very tasty. 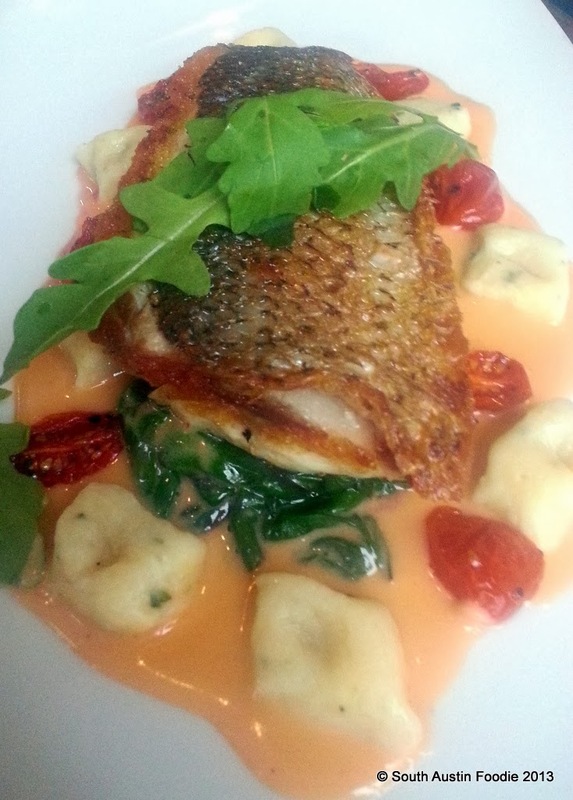 Roasted striped bass with gnocchi, roast tomatoes, and meyer lemon beurre blanc. * The skin was very nice and crisp, and what's not to love about a beurre blanc? 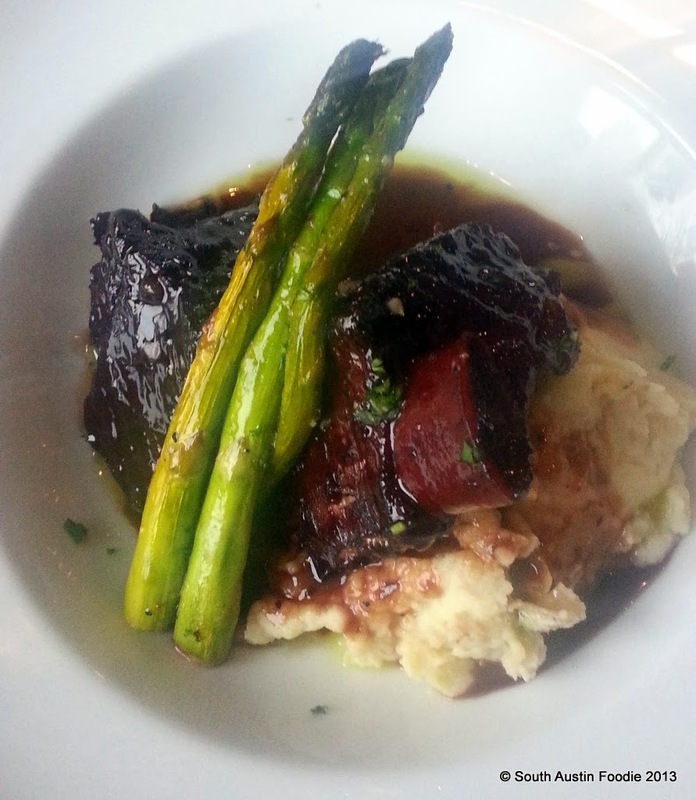 Braised short rib with Cabernet demi glace. * The meat absolutely fell off the bone, and combined with the demi glace, it was an incredible bite. 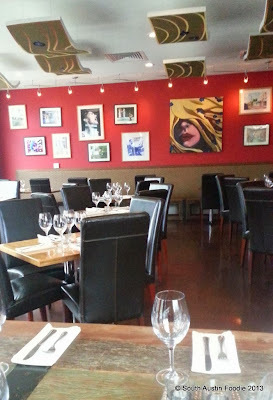 Very vivid decor, from the red walls to the wavy paintings on the ceiling. All the artwork are pieces by the Zach Scott Theater family. Nice high-back leather chairs give it an extra touch of class, but the wooden tables keep Flour and Vine homey and comfortable. Flour and Vine's New Year's Eve celebration is $49/person or $75 with wine pairings. It includes an amuse bouche of smoked salmon and caviar. Course one, your choice of a beet and goat cheese napoleon or butternut squash soup. Course two, choices are: gulf shrimp, stuffed quail, or polenta cakes. Course three: short ribs, duck breast, striped bass, or mushroom risotto, followed by dessert. 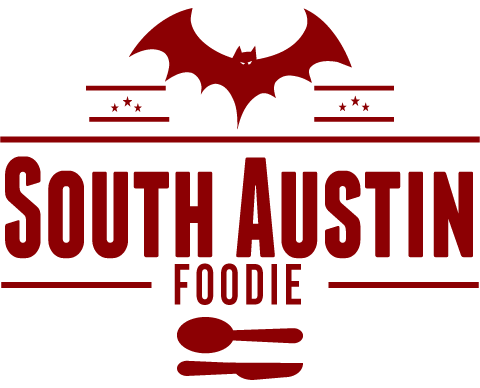 Call the restaurant at 512/474-4846 to reserve! 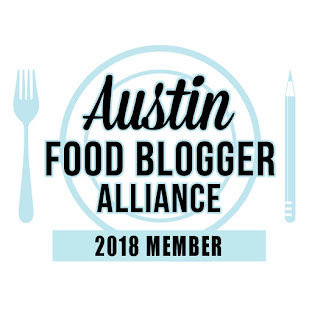 *I was invited by the restaurant to try their food, but was not paid for my opinions. No money exchanged hands. Mmm, quail! I'll bet they use a pastry bag to stuff them. Or very small hands.